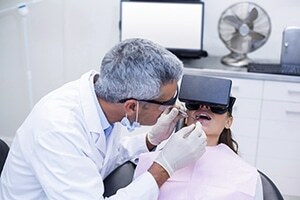 I recently read an article in the Verge that a study carried out by Environment and Behaviour has considered the use of VR as a distraction intervention to help patients cope with unpleasant procedures in dentistry. Researchers considered virtual reality in the context of the environment and tested how interacting with nature VR influenced experience and recollected pain after 1 week. The study recruited 85 participants who needed dental treatment, such as a filling or extraction and put them into three groups. The first two groups had headsets and the third group did not have a headset and were used as the control group. The VR groups either got to explore a beach or navigate a city, whilst the control group only had the surroundings of the dental room. Following the treatment, patients were then asked for their comments after the appointment and a week later. The study found that the people immersed in the coastal VR reported less stress and pain than both the patients navigating through the virtual cityscape and the ones with no distraction. Whilst VR is not in practice, it is still important for people to attend the dentist regularly. It is also important for people to take responsibility for their own dental health. Having poor oral health is a risk factor to other diseases, such as heart disease and type II diabetes. – Tooth decay, which if left untreated can lead to toothache, swelling in the gums near a painful tooth, abscesses, bad breath and can lead to the eventual loss of the tooth or teeth. – Periodontal disease, where the gums are swollen, and may bleed on brushing and a person can end up losing several teeth as a result. A person suffering from poor oral health may also find that they suffer from loss of sleep due to dental pain and this can have an impact on ones work life, necessitating time off work or school. It can also affect ones social life in that a person may be restricted in their food choices and may not be able to socialise as often. The research seems promising and may act as a great tool for those who are anxious of dental treatment and who require a distraction. It may also make dental treatment for children less traumatic. Clearly, more research will need to be carried out as the study only recruited 85 people. However, the findings do seem encouraging and perhaps this will be something that we become more familiar with in years to come.